Team Caledonian, without all of whom, none of this would be happening. Instructor : Guy Ramsay began serious martial art training in 1986, moving from shotokan to the more fluid system of shorinji kempo, with its strong buddhist ethic, which is still prevalent to Guy's attitude towards training. Achieving his second dan in kempo, Guy began flirting with muay thai, attending seminars by masters Sken, Woody, and Toddy in England and Scotland. His first foray into full contact fighting was under the auspices of Duncan Airlie James, world champion kick and thai boxer. As Duncan shifted emphasis towards the emerging vale tudo scene, Guy began training under muay thai kru John Craig of the S.M.T.C. 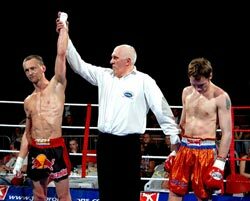 In 2000, Guy made the scottish squad as the light middleweight representative for the world cup in Bangkok. Whilst there, he won the bronze medal, and took a professional fight in which he stopped his opponent in the 4th with low kicks, giving away 10kgs into the bargain. Guy successfully completed a degree in sport science, which has drastically changed both his teaching and training methodology. Forging strong links between private, public, and educational institutions, Guy has worked very hard setting up what is now Caledonian Muay Thai. In January 2004, Caledonian became an independent camp, as a result of an amicable split between Guy and John Craig. Caledonian has gone from strength to strength, holding pro titles at Scottish and UK level, fielding fighters all over the world and, while ostensibly retired, Guy remains competitive - occasionally returning to the ring when time allows. In 2005 Guy set up the Griphouse Gym, which acts as the full time training HQ for the Caledonian Fight Team. Instructor (Griphouse, Caledonian Uni, Glasgow Uni) : Thomas Young is a Personal Trainer who for only his second fight took on a Thai in the Ratchadamnern Stadium! Hooking up with James Doolan of the Dinky Ninja Fight Team (who are heavily involved in the Scottish and UK Mixed Martial Arts / MMA scene), the pair have developed some of the slickest pad drills around. Currently brushing up his already formidable skills (Thakoon has placed T in the world rankings) at Sasiprapa gym in Bangkok, Tommy will be back in a few months to share his knowledge with the team at the Griphouse and his club at Glasgow Uni. Tommy looks after the Sunday classes at Caledonian, so check 'em out. Instructor (Griphouse, Caledonian University) : James Doolan Joining the coaching staff is James Doolan, current STBA light welterweight thai champion, and mma k.o expert. James is one of the foremost fighters to have emerged from Scotland in recent years. Available for private tuition at the griphouse, James also shares coaching at Caley Uni with Guy, Lyn, and Tommy. Instructor (Griphouse) : Hilary Mack Hil is the women’s senior coach and the top UK fighter at 53kg, recently defeating J.Martinez (euro-champ) and 3 time world champ J.Short. Instrumental in shaping the women’s fight game with her strong clinch and punishing body kicks, Hil remains a bastion of the Caledonian fight team, and has supported Guy and Caley from the beginning. Instructor (Griphouse, Caledonian Uni, Glasgow Uni) : Lyn 'Quadzilla' Min-Din First rate technician and excellent clincher, coupled with a good understanding of both Muay Thai and jujitsu, Lyn's laid back manner belies his energetic and demanding classes. Duncan Ireland The power behind the website. Duncan's efforts in managing the website, and his good organizational skills have been above and beyond the call of duty. An IT professional, Duncan has donated his time and expertise to the Caledonian cause in return for bruises, sweat and blood. Duncan showed his team spirit in the USA championships by demolishing fellow scot Del Simpson's potential final opponent in the qualifiers, allowing Del to claim the gold for Scotland.